Once considered somewhat high-risk in terms of driver and passenger safety, the SUV auto segment now includes some of the safest models on the road. Advanced technology incorporated into the body construction, more attention to the effects of side-impacts, and active safety systems found within the cabin all combine to ensure peace of mind while operating one of these mid- to full-size vehicles. Consumers are now spending more time researching safety and security before making a purchase of a new SUV. The 2013 model year includes numerous models that haven been given high accolades for safety, based on Insurance Institute for Highway Safety (IIHS) crash tests. Some of the top picks from the IIHS are listed below. 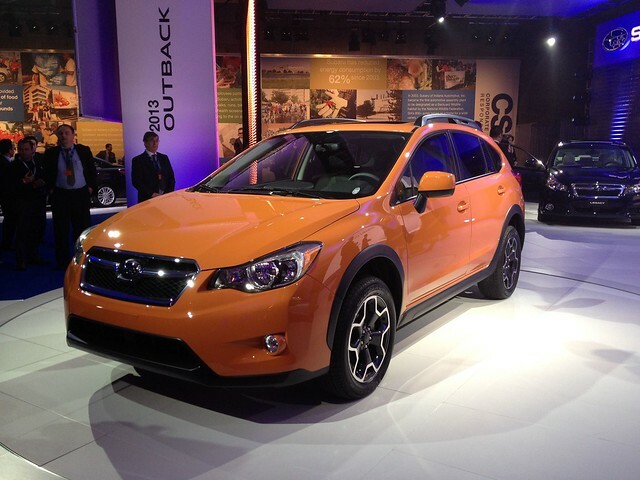 The 2013 Subaru Crosstrek earned an IIHS Top Safety Pick because of its good performance in crash tests. These tests included moderate overlap front, rear, side, and rollover. The Crosstrek model comes with advanced symmetrical all-wheel drive, vehicle dynamics control, 4-wheel anti-lock brakes, and brake assist. The ring-shaped reinforced frame stands up well to rollover tests and is one of the most advanced engineering accomplishments Subaru has introduced. Inside the cabin are a full set of airbags including frontal bags for the driver and front passenger, knee airbag for the driver, and front seat-mounted bags for the forward seating position. The rear occupants are protected by side-curtain airbags, and all seating positions have height-adjustable, 3-point seat belts. Another Top Safety Pick is the 2013 Hyundai Santa Fe. This model also scored high on front, side, and rear impact tests. The Hyundai Santa Fe has a total of seven airbags and features downhill brake control technology. The hillstart assist control prevents the vehicle from rolling backwards when starting forward on a steep incline. Hyundai includes its Vehicle Stability Management system into the Santa Fe model. The computerized program coordinates the traction control and electric brakeforce distribution, ensuring better overall control for the driver when operating the vehicle over uncertain terrain. Both the Sport and Sport 2.0T trims come equipped with a energy-absorbing steering column, seat belt pretensioners with force limiters, the LATCH system for child safety seats, and front/rear crumple zones. The Santa Fe is rated as one of the safest SUVs for the 2013 model year. The IIHS gave the 2013 Ford Escape good ratings in all tests conducted. This model also received a Top Safety Pick and is considered far safer than some of the previous years’ offerings from Ford. The 2013 Escape is a 4-wheel drive, SelectShift Automatic® model loaded with safety features. The roll stability control system is quite innovative and includes curve control that automatically slows the vehicle when the sensors detect abnormal friction location on the tires during sharp turns. The model contains all the usual front- and side-impact airbags and also comes with a tire pressure monitoring system. This model has undergone a major upgrade to its safety systems following the implementation of more stringent testing by the IIHS. The 2013 Mazda CX-5 now has a much stronger roof that has stood up well to the IIHS roof pressure test. The impact tests resulted in a thumbs-up. The CX-5 is loaded with advanced safety features including Dynamic Stability Control and a new, innovative blind spot monitoring system. The foldaway brake pedal assembly is standard equipment as is the engine immobilizer and remote anti-theft system. With fuel costs remaining high, economic factors and government regulations are also having an impact on safety. Vehicles tend to be lighter and use more technologically advanced materials in order to attain better fuel economy. Insurance costs also favor safety as auto insurance information shows that safer drivers pay lower rates.